The conference accepts papers written in English, Spanish, Portuguese and French. All accepted submissions are published in the proceedings with ISSN, ISBN. Full papers undergo double blind review, and if accepted, are presented and published with DOI, indexed by EBSCO, and processed for evaluation by Scopus and other indexes. While Work in Progress submissions undergo single blind review, are presented as posters and published. Submissions to the student paper competition undergo single blind review, those selected compete in poster competition and their papers are published. The top 10 finalist compete in a technical presentation are published with DOI and submitted for indexation. The winner receives an all expense paid trip and registration to compete in the global competition. 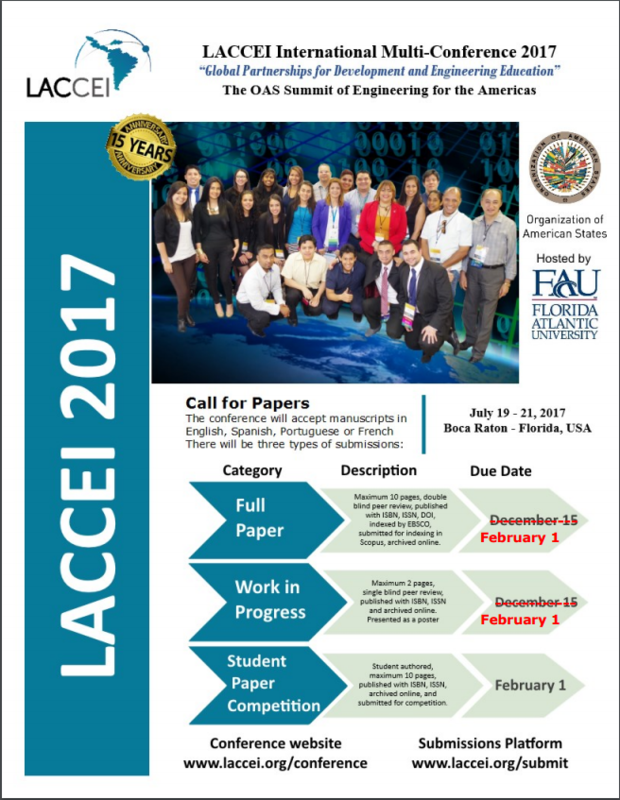 Active LACCEI Institutions receive one free full registration.